Homicide Detective Ryan Clark has a problem. A prominent businessman has been assassinated by a drive-by shooting. Two weeks earlier another man, in the same industry, was shot and killed. He suspects the assassinations are related and calls an old friend with the FBI. When FBI profiler Special Agent Sean Kruger arrives at the scene of the second murder, he agrees with Clark but is hesitant to get involved. After twenty-five years with the FBI, he is tired of the bureaucracy and politics of the job. His constant traveling has kept him away from the woman he loves and he is contemplating retiring to start a new life with her. A week later, while home in Kansas City, the assassin strikes again, this time close to where he lives, making things personal. With the help of JR Diminski, the computer genius from The Fugitive’s Trail, Kruger identifies a suspect and travels to Alabama for the arrest. Politics and micromanaging complicate the situation. Kruger is ordered to wait but disobeys and proceeds with the arrest. When everything goes horribly wrong, he is suspended by the Director of the FBI. Now outside the protection of the agency, he must decide whether to walk away from his career or put his new marriage and life in danger by pursuing the assassin. An assassin whose ultimate goal is an attack in the center of the United States, an attack that will result in more innocent casualties than 9/11. Missouri author J.C. Fields earned a degree in Psychology and. After college he joined a large computer corporation and has utilized skills learned there to introduce computer usage to numerous companies. This mastery of the computer technology made Fields’ movement into the Blog system of sharing his writing skills with a broad audience a natural transition so that now he can devote his time to his passion for writing, creating short stories and novels in the mystery/thriller and science fiction arenas in the printed form also. He is currently the Treasurer for the Springfield Writers' Guild, a chapter of the Missouri Writer's Guild. THE FUGITIVE’S TRAIL was his publishing debut – THE ASSASSIN’S TRAIL now follows in those fine footsteps. What we are fortunate to now realize is that this second book represents a series named after the lead character of these novels- Sean Kruger. Fields writes as though he were preparing a screenplay, so assiduous is his setting the atmosphere of the scenes of his novel. The first chapter is a fully realized crime, adroitly scribed, and this skill follows the writing through the book. Excerpt – ‘The assassin waited on the parked motorcycle, a helmet obscuring his face. One parking space away was a black Mercedes convertible, its top down. His hand, hidden inside his leather jacket, held a suppressed SIG Sauer automatic. He watched the tall, well-dressed man exit the Starbucks and wave to someone inside. As the man approached the Mercedes, the motorcyclist’s grip tightened as he prepared to withdraw the weapon. Headlights flashed on the Mercedes as another car pulled into the empty parking space next to him and blocked his view of the tall man. A wave of panic engulfed him; his target was about to get away. As the man opened the driver’s side door of the Mercedes, the motorcyclist realized he might have one more opportunity if he hurried. Leaving the gun inside his jacket, he started the motorcycle as the Mercedes backed out of its parking space…’ Enough of a teaser. 5.0 out of 5 starsMastermind terrorist attack exposed and eliminated. J.C. Fields used what he knew to write a fascinating thriller suspense novel. He splits his two greatest interests between the lead characters; Sean Kruger is an FBI special agent that specializes in psychology. JR is a computer wizard. But throughout the whole book you will find he uses the topics he knows best. His extensive travel is seen when Sean has to travel back and forth to different areas of interest. Plus weapons are used throughout the whole book while Sean tries to narrow down where the terrorist will strike next. The Assassin’s Trail will keep you anticipating from chapter to chapter until the clash comes to a head. Sean is very careful to treat the people he works with in a kind and respectful manner, always trusting his gut. Therefore, he has multiple acquaintances throughout the nation at his fingertips willing to give him a helping hand in his investigation. The system used by the terrorist to get a message to another individual is quite brilliant. The Assassin’s Trail is fast pace but realistic. 4.0 out of 5 starsHighlights Todays Issue – Thoughtful plot! Highlights Todays Issue – Thoughtful plot! 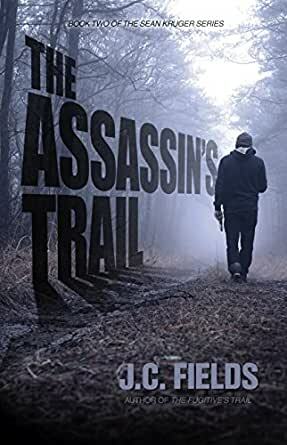 “The Assassin's Trail” is a serial murder mystery highlighting lots of politics in Criminal system that have always existed and probably do today. We still have folks on duty who are dedicated and will do their job regardless of all against them. The story is about FPI special agent Sean Kruger, who has spent 20 years of his life in this career and now wants to retire to spend time with his love of life. But, things happen in a manner that he again need to get involved. The novel is about his journey to catch the assassin, against all odds of him being suspended, to handling dangerous situations to prevent another massacre waiting to happen! The book highlights on one hand, how difficult the life of folks on duty can be that came out very clearly with Kruger’s character and on other hand talks about very talked about topic of shootings around the world wherein innocent people are being killed. The book has good pace, bunch of action but quite a thoughtful plot! 5.0 out of 5 starsOutstanding !!! This book is one of my very favorites..... It is very well written and well reasureched as to believable information regarding the military, as well as locations I am familiar with. True!y hard to put down. Always an enjoyable trip with lots of discovery. A good investigative mystery. It will keep you thinking to the very last minute. Read on. You can be pleasantly surprised.